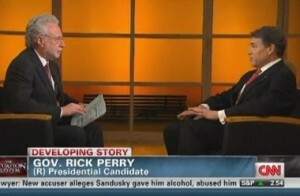 Governor Rick Perry was grilled by Wolf Blitzer on CNN‘s Situation Room on Wednesday, December 7, with frequent interruptions and repetitious questions. (Full transcript, here.) “Blitz” once again earned the nickname given to him by Herman Cain. The Houston Chronicle, which leans far to the left, reported on the interview in a blog entry entitled, “Perry talks about pain meds, gay Scouts and the VP job”. Perry pointed out the difference between “freedom *of* religion” and “freedom *from* religion.” The question should be whether the First Amendment phrase “and the free exercise thereof” means anything. Under the Bush Administration, Catholic Charities and hospitals weren’t forced to provide adoption services for homosexual couples or to pay for abortifacients like EllaOne or refer to abortionists in order to provide adoption assistance or prenatal care. The Obama Administration is doing just the opposite. On top of the policies of the States of Illinois, Massachusetts, and others that are limiting Christian, pro-life adoption agencies, the Obama Administration is moving forward on regulations to severely restrict conscience. Must every agency that receives tax money provide an absolutly full range of services? Lay aside the fact that adoption and abortion are not compatible with one another. It seems evident that birth mothers and and adoptive parents that go to Catholic charities and adoption agencies would have a pretty good idea about the philosophy of the group based on religious tenets. That’s probably the fear of the prospective gay adopters: as the Governor says, “People will vote with their feet.” Why would a prolife Catholic girl who finds herself an unplanned pregnancy – who admittedly has most become pregnant by committing what she considers a sin – “choose” to have her baby raised in a home that doesn’t share her values? And why on earth would she ever “choose” to seek care for herself and her baby from a doctor who also kills the babies of other women? The advocates for choice must, in fact, hate choice – they certainly fight to prevent it, even to demand that we act against our own “choice” and conscience.